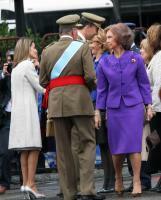 Arrival at the la plaza de Colon of the royal family, King Juan Carlos, Queen Sofia, Crownprince Felipe (in uniform), Crownprincecess Letizia (in white), Princess Elena (in black), Princess Christina with her husband mr. I–aki Urdangarin for the military parade. Prince Felipe and Princess Letizia opened today the Instituto Cervantes in Frankfurt. Spanish Royal Family visited the Expo 2008. King Juan Carlos, Queen Sofia, Prince Felipe, Princess Letizia, Princess Elena, Princess Christina with her husband mr. I–aki Urdangarin Liebaert. Expo 2008 is an international exposition held from 14 June to 14 September 2008 coordinated by the Bureau of International Expositions, the organization that is responsible for sanctioning World's Fairs, held in Zaragoza, Spain, with the topic of "Water and sustainable development". The event is being placed in a meander of the river Ebro.